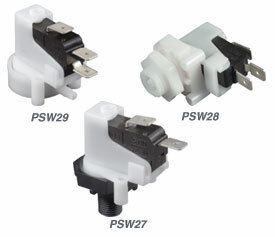 The PSW27, PSW28 and PSW29 Series have been discontinued. Some stock still remains; please check the specific item you are seeking to see if there is remaining inventory. Please see the Pressure Switch Product Finder or contact Omega Sales for possible alternatives. These reliable compact single pole switches are used in pressure and vacuum applications where moderate accuracy is sufficient. The fixed setpoint is factory set. Electrical: SPDT; 250 Vac, see table for Amp rating. 참고: Note: Mineral Oil and similar fluids are not compatible with EPDM.